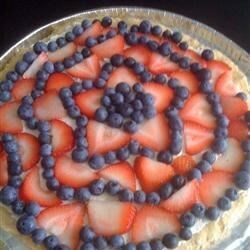 "Refreshing sliced fruit and creamy whipped topping over a tender cookie crust - delicious, impressive, and easy. Enjoy! Kiwi and peaches may also be added to pizza if desired." Press cookie dough evenly into a 12 inch pizza pan. Bake in preheated oven for 15 to 20 minutes, until golden brown. Cool in pan on wire rack. Spread whipped topping over cooled crust. Arrange fruit in a decorative pattern. Refrigerate until ready to serve. Display red, white and blue pride with pizza!